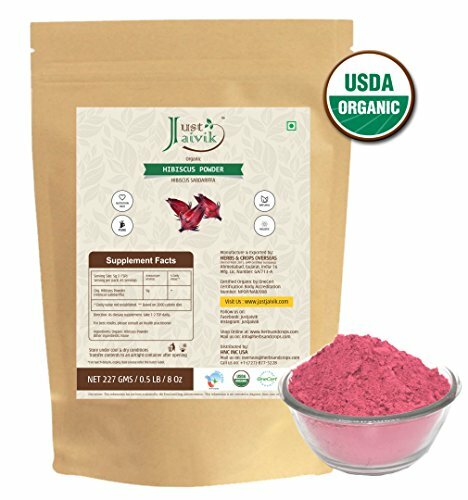 100% organic hibiscus flower powder made from rosa sabdariffa or hibiscus sabdariffa. Certified organic under usda organic nop, and india organic npop standards. Organic Hibiscus Powder is known for its pleasant fragrance and the aromatic properties. It is used as prime herb in various herbal cosmetic formulations for hair. Many people use it with henna to give a aroma and refreshing feeling to hair. Hibiscus is also a main ingredient in many wonderfully refreshing teas made around the world. Recently, hibiscus has been added to many ready made teas due to its high levels of anti-oxidants, and has even become the main flavoring agent in certain sodas. In Indian Ayurveda, hibiscus flowers are considered highly sacred. They are used in spiritual practices for their ability to open the heart and encourage love and devotion. When used internally, hibiscus removes excess heat from the body and supports a healthy circulatory system. Non-GMO, and contains no chemical pesticides, artificial additives or preservatives. Process in FDA Registered Facility with highest standards. Certified Organic under USDA Organic NOP, and India Organic NPOP Standards. If you have any questions about this product by Just Jaivik, contact us by completing and submitting the form below. If you are looking for a specif part number, please include it with your message.